A family spokesperson confirmed Saturday that boxing legend Muhammad Ali will have a public funeral held in his hometown of Louisville, Ky. this Friday. Among those expected to give eulogies are former President Bill Clinton, actor Billy Crystal and sportscaster Bryant Gumbel. 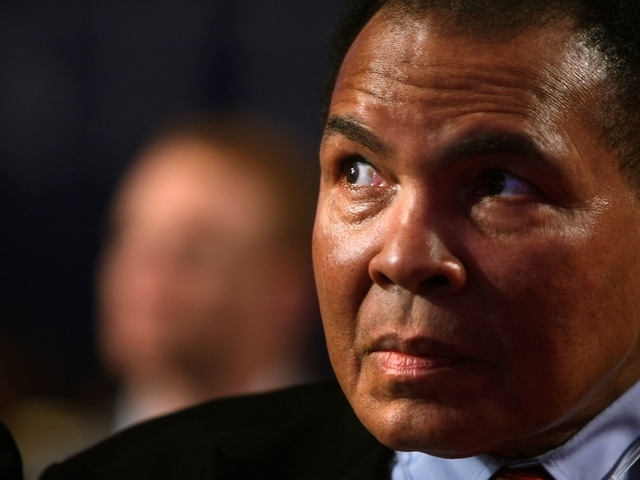 Ali died Friday evening in a Phoenix-area hospital. He was pronounced dead at 9:10 p.m. local time due to septic shock from natural causes. A medic was called to Ali's home in Phoenix on Tuesday as the three-time heavyweight champ was suffering from respiratory issues. Nearly a decade ago, Ali opened an $80 million cultural center in his name in Louisville. One of Ali's last public outings was also in Louisville last fall. The funeral will be held in the KFC Yum! Center beginning at 2 p.m. Friday. The Yum! Center is the home of the University of Louisville basketball team, and just blocks from Ali's cultural center. The Yum! Center can hold 22,090 people. "The entire Ali family invites everyone to join them for the celebration in Muhammad's hometown of Louisville," family spokesman Bob Gunnell said. "Muhammad will return to Louisville within the next 24 to 48 hours." The spokesman added that there will also be a private service for the family of Ali's in Louisville on Thursday. After fighting controversy in the 1960s due to dodging draft obligations during the Vietnam War, Ali participated in a number of humanitarian and peace projects. In 2005, Ali was awarded by George W. Bush the Presidential Medal of Freedom. "Muhammad's boxing career only encompassed half of his life," a family spokesman said. "The other half was committed to sharing a message of peace and inclusion to the world. Following his wishes, the funeral will reflect those principles and be a celebration open to everyone." The plans for Ali's memorial were made years ago, and done by Ali according to Gunnell. Ali's spokesman said that a large funeral possession will lead Ali's body and family through the streets of Louisville, including down the street named after Ali, and through Ali's old neighborhood. For those wanting to attend the ceremony at the Yum! Center, a limited number of tickets will be made available later this week. For those unable to attend, the event will be streamed live.